The Genetics Society of America’s Elizabeth W. Jones Award for Excellence in Education recognizes significant and sustained impact on genetics education. 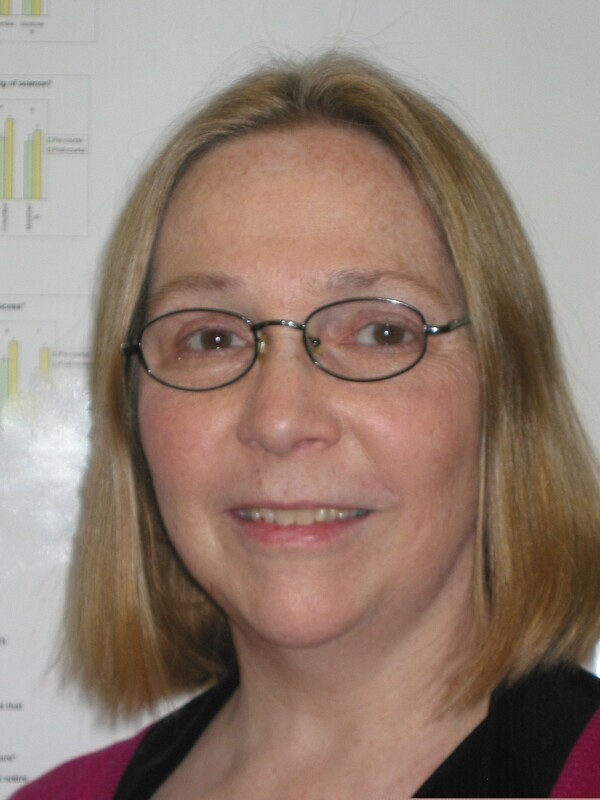 The 2017 recipient is Sally G. Hoskins, in recognition of her role in developing and promoting the transformative science education method CREATE (Consider, Read, Elucidate hypotheses, Analyze and interpret data, and Think of the next Experiment). This innovative approach uses primary literature to engage students, allowing them to experience for themselves the creativity and challenge of study design, analysis, interpretation, collaboration, and debate. Comprehensive evaluation of CREATE has consistently found that students improve in difficult-to-teach skills like critical thinking and experimental design, while showing improved attitudes and beliefs about science. An abridged version of this interview is published in the December 2017 issue of GENETICS. What’s your most memorable moment from your career so far? I had the idea, I fought for the experiment, the experiment worked. That was a good feeling. One of the things we do in CREATE is interview the authors of papers by email, using students’ questions. In one of our courses recently, Elaine Ostrander, who works on dog genetics, did a phone interview where the students asked what she liked best about being a scientist. She said something along the lines of: “I love that moment when you look at the data, and something comes together, and you figure something out, and for that moment you’re the only one who knows it. And you savor that discovery before you call the rest of the lab.” It was nice to have somebody articulate that for our students. Unfortunately, the image of scientists is very distorted in pop culture, so it’s nice for students to get behind the scenes and learn scientists are simply people who love trying to figure things out. Why did you choose to focus on primary literature as a teaching mode? It grew out of my teaching at City College. I really hated lecturing and I had had some very good teachers in undergrad and grad school who used literature in classes, and so I started to introduce that approach. CREATE came about because I’d been giving out papers with the very poor approach of just saying to the students, “read this.” I’d be miffed that they didn’t really have a lot to say about the paper. It’s a big jump from reading textbooks to reading papers, and I hadn’t helped them at all. Then at one point while we were studying a paper, a follow-up paper came out, and I thought it would be cool for them to read it. But the second paper was so much easier for everyone that a light bulb went on for me. Now everyone understood the set-up, and the technology, and the basic question, and they also now cared about the questions. So, I realized it would be smart to do these papers in series. Then my collaborator Leslie Stevens and I further developed the idea by first figuring out how we had learned to read papers in grad school, and then codifying that process to guide students through deep analysis of study designs and the data produced. No offense to textbook authors—I know there are some really heroic efforts going on to write new kinds of textbooks—but in general textbooks are easier reading than the original papers because they simplify papers drastically. But if our students get out into the world, if they do science they’re going to be reading papers, not textbooks. It’s a skill that’s worth learning, and it’s not as hard as it looks, it’s just that the jargon is so dense and the initial hurdle is high. Some students have also developed this habit of just reading the abstract. If you’re in a class where papers are “read” really fast, and you have to get through 30 papers in a semester, then the abstract may be all you need. But we wanted to go slower and deeper, basing it on how we learned this skill in grad school. CREATE has been successful, and we’ve tweaked and expanded it in various ways. For example, we started it as an elective course for upper-level undergraduates, a focus course to be taken after you’re taken your pre-requisites. Then we realized there are some advantages to introducing this kind of thinking and science literacy in the Freshman year, so we have a version of it for Freshmen. We also have tested it with success in two-year colleges. I think the most rewarding aspect is the idea that you’re teaching students that they can figure out how we know what we know—not just what our current state of understanding is. The papers provide enough information to take you inside the lab or into the field, if you delve deeply. Plus, students develop transferable skills of critical analysis. You’re teaching them approaches and learning strategies that they can apply to any future challenging or analytical task. Biology is changing so fast. There is maybe 30 years’ more stuff in Intro Bio than when I took it. But the semester is still the same length. So, if you do the math, it doesn’t work! How can we keep putting more and more information into these semester-long courses and expect the students to be able to learn it, retain it, and apply it? With CREATE we don’t try to do that, we try to teach an analytical skill set and an attitude that you can take with you, along with a deeper understanding of both how research is done, and the people behind the papers. It’s not like teaching Intro to French. OK I’ve never taught Intro French, but I would guess that you could teach it the same way for 30 years. Maybe there’s a new theory of language teaching, and I’m wrong, but still, you have to learn the present tense and you have to learn the possessive form and the vocabulary words and so on. Yet biology has really changed a lot, and I don’t know that our teaching is reflecting that. For example, there’s probably been six different ways to clone that have come and gone since I was an undergrad. And maybe now someone would just sequence the genome instead! We approach science as an open book activity. People don’t go to their labs and do everything from memory, including making media, calculating antibody dilutions, and the like. But when we evaluate learning only through closed-book tests, that’s the skill we’re saying you need. CREATE doesn’t emphasize memorization. We emphasize putting ideas together, thinking, logic, collegial argumentation, and creativity. I’ve run a lot of workshops with faculty from a wide range of institutions, and all of them say, “Yes, my students took multiple pre-requisite courses, and no, they don’t come into my class knowing what they “should” know from the pre-requisite classes.” So, I think something is wrong. Part of the reason may be that most college teachers, including myself, had no training in teaching or in the science of learning. This is a well-kept secret from people’s parents, that their kids could be being taught by somebody who’s never been in the classroom before; or even if “experienced”, someone lacking training. Your third-grade teacher has studied something about teaching and learning, and has student-taught and been observed in the classroom, and that’s not true for most scientists. Things are changing, but still some college faculty have this boot camp kind of thinking: “Well I went through it (being taught only through lectures), so why can’t you?” Maybe there’s a better way. Maybe there’s a way that would not just get students through biology, but also get them excited about it. Many people are working on this; our way is through in-depth analysis of primary literature. Anyway, I read up, and I wrote a grant on my sabbatical. It was totally hypothetical, we didn’t have pilot data. But the grant reviewers really loved the idea, and we got the money. We started teaching the course, and it immediately started flopping. It was not working at all. I didn’t understand. The grant reviewers had loved it, and we were doing what we said we would, so what was wrong? It turns out that when scientists read a methods section, they can visualize what happened. But when students “read” the methods section, they either weren’t really reading it or else they weren’t reading it with an eye towards picturing what went on in the lab. And when I added a “sketching,” step—where they draw in their notebook how the study was done in the lab or field to generate the data represented in each figure—that was when everything started to work. The class was much more lively, and people were “getting it” and having things to say, rather than just limping along or waiting for me to revert to a lecture. Discussing the data made much more sense once students “saw” where it came from. You can’t fake a sketch; to produce one you must read the methods closely. That made a huge difference. So it was the students who revealed that there was a gap in the approach, and it turned out to be really key to the whole thing—we needed to add a visualization step. What would you say to someone concerned about trying the CREATE approach? Some faculty, especially (and understandably) if they are only evaluated through student reviews, are very afraid of students’ negative reactions to any change in teaching. With CREATE we’ve generally had around 75 to 80% positive reaction. We’ve also always looked at both cognitive gains, like critical thinking or experimental design, and effective gains, like students’ attitudes and epistemologies of science. I’m really happy that we see significant positive changes in both. So, it’s not that CREATE makes you feel better about science, but you don’t learn anything. The strategy affects students in multiple ways, building transferable thinking skills along with positive views of research/researchers. There’s a big issue with science education reform where people say, “I would like to change but I can’t because I have to cover content.” But a) covering is not teaching, and b) CREATE includes content! To really understand a paper, you’ve got to understand key content. A huge amount of content is reviewed and consolidated in a CREATE class, but it’s in context. In fact, you have a lot of opportunities in a CREATE classroom to integrate the sciences, for example quickly reviewing some of the underlying principles of chemistry or physics, that are associated with the experiment you’re studying. Some people are also a bit iffy about the e-mail interviews of authors. But the things we learn from the interviews are profound. Dr. Elaine Ostrander, a Distinguished Investigator and Comparative Genomics section head at NIH, was asked what happens if an experiment doesn’t work and a hypothesis must be discarded, and students always assume the answer will be “Oh, I feel so bad, I want to die!” But there are many rejected hypotheses on the road to success, which is not something you really learn in many Intro Bio labs. So, when Elaine Ostrander got that question, she said, “If all your experiments work, then you really aren’t asking very interesting questions.” Failure is a normal part of science. If I had learned that as a sophomore, it would have changed me! Another cool thing that happens with the e-mails is the insider info you can get. We read two papers that had been published back-to-back in Science about regeneration and the Wnt pathway of Planaria. One lab had knocked down one molecule in the pathway and their animals regenerated tail-tail. And the other group altered a different part of the pathway and got head-head. We send the same questions to the grad students and postdocs as we do to the PIs. When we wrote asking how they set up the back-to-back publishing, one post-doc said, “I went to a meeting and I was going to present my tail-tail stuff and saw another post-doc present the head-head stuff. So, I called my PI and the two PIs discussed it and we decided to not communicate for three months and then publish together.” In class, we discussed alternative ways the PIs might have reacted. We got a lot of mileage out of closely comparing the two papers; the students pulled out all the similarities and differences in experimental paths taken by two different groups to reach the same basic conclusion. So, the e-mails really complement the deep understanding of the papers by putting context around it and making it clear that these studies are done by “real people” who remind my students of themselves, and not only by famous senior PIs. Ultimately, for change in education, you have to get the teachers to change what they do. And that’s challenging because for many people teaching can’t be their number one focus. When we invented CREATE, we felt like we were really helping in that regard, in the sense that we were leveraging people’s deep understanding of research that they didn’t get to bring to class because they were busy lecturing, lecturing, lecturing. Professors’ understanding of how research is done and critically evaluated, built over years of study, comes into play in virtually every CREATE class. You can switch over your upper level elective to a CREATE course pretty easily, especially if the elective is in your area of expertise. I think it’s valuable for students to realize that their faculty are serious researchers and not just PowerPoint presenters. I understand that there are multiple pressures on people these days, but I think this is a much more fun way to teach. It’s not just that it’s good for the students, there’s a big payoff for the faculty as well. Unless you really love your PowerPoint. I have a collaboration with Kristy Kenyon and Stanley Lo following up with faculty who use CREATE. We’re interested in what it takes to change a teacher’s approach. There are a lot of different workshops and training on alternative ways to teach, but there isn’t a lot of evidence yet that they have a lasting effect on teachers. We’re trying to help with course design by posting tested CREATE modules on our website, www.teachcreate.org. Of course, we’re also interested in the effect of CREATE on students. We’ve been looking at the extent to which CREATE shifts students; perspectives on science to be more like experts’ perspectives. The interesting thing is that CREATE courses don’t have a hands-on component, and yet we’re seeing a lot of shifts in student thinking to be more like that of someone who holds a PhD. Another project is a collaboration with Alison Krufka of Rowan University on a variation where you take a traditionally taught course, and you take just two weeks to do CREATE. We’re testing whether a small dose of CREATE will have an impact or not. We also have a project on a new approach to using CREATE in introductory biology at community colleges. We originally designed it for upper-level courses, and then we designed a scientific thinking course for Freshmen. But what if you have to teach Intro Bio with ten major topics? Is there an easy way to use CREATE there? We’re just analyzing the data now on whether you can increase student understanding by using CREATE modules focused on the major themes that you always find in Intro Bio, like meiosis, rather than purely textbook teaching. Maybe something in music, which has been an important part of my life. I founded a womens’ chorus in Manhattan and ran it for about seven years. I also like design. Again, it’s working with your hands and making things. And also, there are all kinds of ways to be a scientist, so if you do an undergrad research project, and you’re not thrilled with bioinformatics, for example, there are a million other things you could do. One thing nice about CREATE is that you can teach diverse modules where, say, one is all about regeneration in Planaria, and one is all about behavior in ants and so on. Some people love doing field work and some people would never do field work and some people would never sit and look through a microscope all day; there are distinct research options available for all these individuals. Intensively analyzing papers in different fields can give you a taste of what the work is like.